We design, install, and repair sprinkler systems. Our new systems include a free rain sensor that temporarily turns your system off when it rains. We mount sprinkler heads located in turf areas on flexible hardware that resists breaking when hit by mowers and other equipment. We also offer sprinkler and irrigation drip systems which can be the most efficient way of having your lawn correctly watered. Many home owners and businesses opt for a sprinkler system that they can set and forget. As with any sprinkler or sprinkler system, there are times when you’ll have to check, adjust and repair. A common repair that we deal with is a faulty solenoid in sprinkler systems. In dry climates, like we have in Waco Texas, or during periods of little rain, one section or zone of a sprinkler system will look produce different results than other zones. Either the sprinklers in that region will not switch on, or they will be on continuously. Solenoid malfunction is the indication of a valve becoming inoperative, either remaining in the closed position, or remaining in the open position. Usually this will disable a complete sprinkler zone, so is generally easy to diagnose. 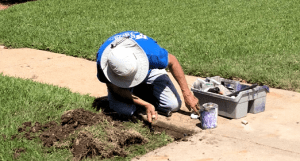 We can help with this situation, and you will get much more information on sprinkler installation and lawn care in Waco by giving us a call today. Be sure to ask about our sprinkler maintenance packages! Need work done on an existing irrigation system? Our service team can assist you with your irrigation system. If you are having irrigation issues, our staff can assess the situation and make any needed repairs promptly and efficiently.